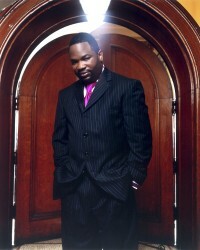 Tony Cummings looks at the extraordinary rise of choir leading pastor HEZEKIAH WALKER, friend to some of the biggest names in R&B and hip-hop. In a gospel music age which has seen the gradual dwindling in popularity of the gospel choir, Hezekiah Walker And The Love Fellowship Crusade Choir (or LFC as they're now known) is the exception to the rule. Every album recorded by the aggregation seems to climb high into the US gospel charts while you'd be hard put to find an African American church that doesn't have at least one Hezekiah Walker song in their repertoire with songs like "The Lord Will Make A Way Somehow", "Oh Lord We Praise You", "Power Belongs To God" and the Grammy-nominated "Lift Him Up" connecting with congregations big and small. As well as being a genuine gospel music star Walker has the unenviable task of pastoring not one but two churches. He told journalist Andrea R Williams, "It's a little difficult balancing the roles I play, especially being a pastor. I pastor two churches, one 15 minutes away from Philadelphia in Bensalem, Pennsylvania and I also pastor in New York City. So it's really difficult pastoring in two cities and putting on the artist's hat. But it's fun. The roles differ - being a musician, choir director and a singer - it's a big difference, but I love all of them. I've been pastoring at Love Fellowship Tabernacle since 1994. We started the church in New York in 1994 and we started the church in Pennsylvania in 1998. It's tough, but you know what gives me the inspiration? The people, when I see them being blessed. And the music has attracted people to the church so that's been really good." Hezekiah was born on 24th December 1962 in the crime and drug infested Brooklyn housing project Fort Greene. He grew up without a father and his loving mother died young. At the age of 13 Walker turned his life over to Christ. By 1985 as a weekend outlet for his musical abilities, Hezekiah started the Love Fellowship Crusade Choir. They started with 12 members but by the time they began recording in 1987 they were already a sizeable aggregation. Their debut album 'I'll Make It' for the tiny Sweet Rain Records of Bala Cynwyd, Pennsylvania was a surprise gospel hit thanks to a rousing cover of D J Rogers' "I'll Make It" with Walker handling lead and "Spirit" and "The Lord Will Make A Way Somehow" both showcasing the lead vocals of Kervy Brown. The album proved a bit of a launchpad to the more lucrative R&B market, featuring as it did two songs penned by Stanley Brown who went on to be a hit urban producer for Island Records with one of his songs featuring Aaron Hall who would have a successful career as an R&B balladeer in the early '90s. With 'I'll Make It' making 12 on Billboard's gospel chart and its follow up 'Oh Lord We Praise You' making 11 in 1990, Hezekiah Walker & The Crusade Choir were clearly a big gospel act set for a big label. Sought out by Word subsidiary Benson Records the group's next album 'Focus On Glory' climbed to number five and the choir began to tour nationally. Walker says he was shocked by the hypocrisy he found on the national gospel scene. He told Teresa Hairston of Gospel Industry Today, "I was disappointed to get into the music arena and find out that some of the gospel artists were not really living the life that they were singing about. Gospel music was just a job for them. They didn't have the ministry at heart. That bothered me a lot. When I got around them, we all were anointed on stage, but after the concert was over, behind stage, it was a different thing." It wasn't a different thing for the choir's next CD, 'Live In Toronto', though. Like all their others, this one was a bestseller. On the strength of Lorraine Stancil's uncredited lead on "When We Get Over There" the album soared to the Top Ten on the gospel chart. What many consider the Crusade Choir's best album came next, 1995's 'Live In New York By Any Means', which rose to number three on the gospel chart. The CD features some of the choir's most requested songs, such as "I'll Fly Away", "Second Chance" featuring Walker's wife Monique in a particularly stirring performance, and a remake of Dorothy Love Coates' classic "Ninety-Nine And A Half Won't Do". Around this period, Walker founded the Love Fellowship Church in Brooklyn. Within a few short years the church grew from 500 members to a couple of thousand. Walker's youthful ministry and the real, street nature of his personality attracted many hip-hop artists such as Foxy Brown to the church. "About five years ago we started attracting a lot of secular artists to the ministry," Walker told Gospel Industry Today. "We've just been ministering to them. Most of them felt that there was no vehicle back to the church and everybody was shutting them down, but I was able to let them know that we're not going to compromise what we believe, but the church is for all the people. So I extend my hand to them, and I've gained a rapport with them - including Teddy Riley, Puff Daddy, Missy Elliott, Lil' Kim, Dave Hollister." Not only did the Brooklyn pastor welcome mainstream showbiz stars into his church but some began to appear on his recordings. Sean 'Puff Daddy' Combs, who early in his career had confessed Christ (he was, in fact, interviewed in an early issue of Cross Rhythms magazine), performed with Walker and the choir on "Let's Dance". Walker told Gospel Industry Today, "I believe the Church ought to trust us enough to know that we're not going to just put anybody on our records. We actually have conversations with them. We find out where they are and what they're doing. . . A lot of [secular] artists out there have a heart for the Lord. They [went into secular music] because it was a money thing and nothing more than that. We try to give them an opportunity to come back into the church and to sing about their first love." Probably Walker's most controversial move was to lend his and his choir's creative talents to the R Kelly album 'Happy People, U Saved Me' - a much delayed double CD which bemused critics with its celebration of spiritual love on one album and carnal lust on the other. But whatever they wisdom of such musical collaborations, Hezekiah and his choir, having switched from Benson to Verity, continued to enjoy a stream of best selling albums. 'Live In London At Wembley' (1997), 'Family Affair' (1999), 'Love Is Live' (2001), 'Family Affair II: Live At Radio City Music Hall' (2002) and '20/85 The Experience' (2005) have all registered high in the gospel charts. Asked by Andrea R Williams whether the changes in gospel music have been good or bad, Hezekiah had plenty of positive things to say. "I think one of the good changes is that we have a bigger audience now and yet the message has stayed the same. That's what makes it good. When I started in the '80s, no one was listening to gospel music but church people, but now you've got everyone listening to gospel music. The changes have been good." The choir leader, singer and pastor is also very much aware of the downside. "I think some people have come along and changed the role of gospel music. But it's our job to keep it where it's supposed to be in accordance with Scripture. I realise that most people have changed the role of gospel music because most people don't know the Bible like they should. I think it's important that myself and others who have been in the game a long time who know Scripture educate other people that are coming into the industry. There should be a Scripture base - what we should do and the role that we play. It's so important to live the life we sing about. If you talk with most gospel artists, most say that their main goal and mindset is to reach the lost, to reach those who are unchurched. What I've found in connecting with the unchurched - I've been around the major players in the R&B world - I think what the gospel artists don't understand is that they, the unchurched, want to see something different in our lives. They want us to be who we are and they want to see that we're living what we sing about. If you ever talk to any rap artists - I had the privilege of talking to Nas - they say the reason why they rap is because they live it. From what I've heard, many rap artists don't see the gospel artists living what they sing. For a long period of time, Puff Daddy was a frequent visitor to our church and sitting under our ministry. We've also had Lil' Kim and Foxy Brown come to our church. I've counselled with many of them. The main thing that they would say is that they love church, but they have yet to be around some gospel artists that live what they sing. One of the problems that Puffy had is that he saw some gospel artists trying to be like him. And he was saying, 'I'm trying to be like them!'" Hezekiah explained how his relationship with Puffy and Lil' Kim developed. "They started here in New York City. Actually, that title, the Hip-Hop Pastor, came from Puffy and Lil' Kim. They only said that because I was able to reach them and talk to them. The Lord had fixed it so I was able to minister to Puffy during the time when Biggie [Smalls] was killed. He went through a bad stage of depression and someone told him, 'You should talk to Hezekiah Walker.' He reached out to me and I prayed with him over the phone. He was crying and said, 'Pastor, would you mind coming up to my studios and meeting with me?' When I got there, we prayed and talked. Later on, he introduced me to some of his other industry friends and I began to counsel with them and pray with them as well. So I invited them all to church. They were so blown away; at that point, Puffy hadn't been in church in over 10 years. And Kim said that she hadn't been to church since she was a child. They understood that we came to church for one reason and that was to worship. I preached and the Lord touched them. They really felt the power of God. From that point on, we connected. It was then I was dubbed the Pastor of Hip-Hop. They said, 'You're the one that's here and you look like us and dress like us, but yet you've got another message. Your message is Jesus Christ.'" So what does this extraordinary pastor say to those in the Church who criticise his close relationships with R&B and hip-hop stars? Commented Hezekiah, "Jesus said, 'I didn't come to condemn the world, but through me the world might be saved.' The only way the world can be saved is that we have to bridge the gap. Scripture says go into the highways and the hedges. We shouldn't be afraid to go into the world, but we must be careful that when we go into the world that we don't become the world. That's that line that we have to be careful of. When we become the world, the world can't be saved through us. But if we're going to go into the world and save the world, we have to remain the Church." I was going to ask the same question as Rodriguez Linson. And someone has already replied. Does this mean that this music is lost to us forever? : ( Does anybody have a cassette. I'll take it anyway I can. where can i find The I'll Make It & Oh Lord We Praise you Album?